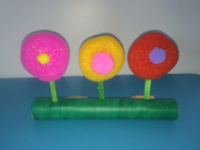 Celebrate spring and explore circles with this colorful craft. 1. Gather your material. 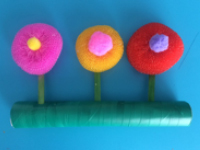 You will need three round scouring pads (bright colors), an empty paper towel roll, three colorful pompoms, three green Popsicle sticks, green electrical tape, two corks, and white glue. 2. 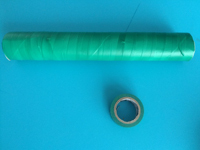 Completely wrap the paper towel roll with the green electrical tape. 3. 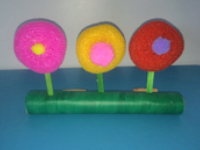 Glue one scouring pad to one end of each Popsicle stick to represent flowers. 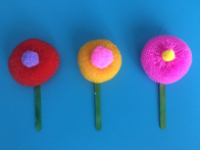 Add a colorful pompom in the centre of each scouring pad. 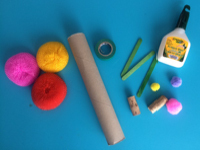 Encourage children to notice that the scouring pads and pompoms are round. 4. Make three incisions in the paper towel roll and insert a stem (Popsicle stick) in each one. 5. 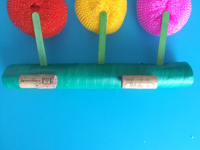 Glue the corks horizontally behind the paper towel roll as shown so it will stand upright. 6. Set your flower bed on a windowsill to welcome spring and add a touch of color to your decor!